Explore optical illusions and find out. Scroll down for an explanation about how the illusion works and how to try this at home. Can you believe what your eyes are telling you in this optical illusion? 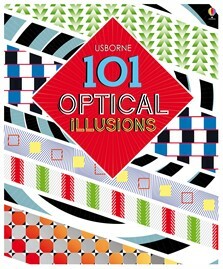 You’ll be amazed at the mind-boggling optical illusions in this book. From colourful spinning circles and baffling beach huts to wobbly lines that are actually completely straight, these illusions will astonish the whole family. Snippets of information explain what’s happening and how each illusion works. You won’t believe your eyes!